'Biofuels’ or ‘Agrofuels’ are fuels that are made from living plants (rather than the “fossilised” ones that make up oil and coal). The theory is that because these fuels absorb as much CO2 when they grow, as they emit when they are burnt, they are basically ‘carbon neutral’. Now, ‘biofuels’ made from waste materials like used chip fat are fine, but these could only ever supply a fraction of the demand if we use biofuels to replace any significant proportion of the transport fuel that now comes from fossil fuels. To do this requires growing crops for fuel (e.g. rapeseed, palm oil, soy, sugar cane or jatropha) on a massive scale (this is why we use the term “agrofuels”). This increases the pressure on land and in places like Brazil, Uganda and Indonesia this increases the pressure on the rain forest and other surviving biodiverse ecosystems. Clearance for palm oil plantations is now the biggest driver behind deforestation in Indonesia and Malaysia and the rate of deforestation in the Amazon Basin has been shown to correlate directly with the price of soya which is set to continue on an upward trend because of agrofuel policies. Even if agrofuels are produced from, say, “certifiably sustainable” rapeseed in Europe this can have knock-on effects – it means there is less rapeseed available to produce cooking oils and foodstuffs and this results in a massively increased demand for Indonesian palm oil to fill the gap. It is often overlooked that deforestation, and land use change, is the cause of about one quarter of total global CO2 emissions. 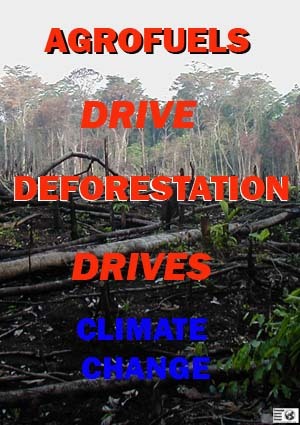 Not only that but some rainforest ecosystems, are thought to be in danger of complete collapse. The Amazon for instance has been ‘drying out’ in recent years and if the process continued vast fires could take hold and precipitate a change to a different ‘dry forest’ or savannah state. This would release vast quantities of CO2 in a ‘positive feedback’ event that could constitute a ’tipping point’ where climate change escalated completely out of control. Deforestation is the biggest driver in this process – combined of course with higher temperatures from global warming, itself exacerbated by deforestation. Not only that but using crops for fuels means there are less available for food – the huge demand of rich countries for fuel to drive their cars around is put in direct competition with the need of people in poorer countries just to eat. Within five years half ofthe US maize harvest is expected to be burned in cars, further pushing up the global proce of what is a staple food for hundreds of millions of people. Different studies show that a high percentage, possibly as high as 75% of the food price rises up to 2008 were due to agrofuels. Jean Ziegler, the former 'UN Special Rapporteur on the Right to Food' has called this a "crime against humanity". For more on the emerging global food crisis see here. There have also been a catalogue of human rights abuses associated with the expansion of agrofuels. In Argentina 200,000 rural families have already been displaced and Victoria Tauli-Corpuz, Chair of the 'UN Permanent Forum on Indigenous Issues' has warned that 60 million indigenous people could become "agrofuel refugees". There have been a growing number of reports of the evictions of rural families and dispacement of food production for jatropha ( grown for fuel), especially. Finally new ‘full cycle’ studies suggest that many biofuels actually cause more emissions than fossil fuel. This is greenhouse gas emissions directly associated with their production, not the devastating indirect, or long-term, effects referred to above. A recent study by Paul Crutzen suggests that the production of biofuel from rapeseed causes 70% more greenhouse gas emissions than those that would be caused by fossil fuels. This is mainly the nitrous oxide emissions from the fertiliser used to intensively farm rapeseed - something still overlooked by the EU. So with all this damning evidence why are they going ahead with a massive expansion of agrofuels? Well, in part at least, its because a new corporate alliance has evolved around the agrofuel boom - which includes oil companies, 'big business' and venture capitalists, car manufacturers and the biotech industry. (Car manufacturers back a "low carbon solution" that does not involve them in making drastic changes to their industry, while the biotech industry backs the genetic modification of crops to make them more suitable for biofuel production). This means there is a powerful self-interested lobby influencing all the decisions that are made. The biggest loophole that this lobby exploits is so called "sustainability standards" which in practice are almost impossible to make effective. EU sustainability standards which will come into force in 2011 are deeply flawed to the point of being meaningless. Under EU rules, human rights abuses, pesticide poisoning and hunger cannot be used as reasons for ruling agrofuels 'unsustainable'. EU greenhouse gas calculations rely on false and creative accounting which contradicts scientific findings. And finally, companies can 'prove' compliance with standards simply by chosing and paying their own auditor - thats like using BAA's Environmental Impact Assessments as 'conclusive proof' that arirport expansion is good for the environment! EU rules, however, do not prevent the UK government from meeting renewable energy targets without agrofuels but at the moment it shows no sign of doing this. The UK government continues to subsidise agrofuel power stations, oblige fuel suppliers to blend biofuels with all transport fuel and to suport the development of agrifuels for planes - thereby massively increasing the demand for agrofuels with all the destructive impacts we have described above. See what Friends of the Earth has to say about biofuels here and read a report from Friends of the Earth Europe on agrofuels here. The European Union biofuels directive sets targets for all EU countries for biofuel usage of 2% by the end of 2005 and 5.75% by the end of 2010. To fulfil this, in the UK, the Renewable Transport Fuel Obligation (RTFO) requires transport fuel suppliers to ensure that a certain proportion road vehicle fuel is biofuel. The amount of biofuel that must be supplied increases annually until April 2013 when it will reach 5%. Biofuels have also been promoted as a potential fuel for aeroplanes, further encouraging unsustainable growth in aviation and increasing demand for biofuels. Biofuels for electricity - coming soon across the UK? There is now a swelling stampede around the use biofuels for the purpose of generating heat and electricity in power stations .The use of biofuels as transport fuel has already drastically increased demand, but now this demand is set to rise yet higher as more and more applications are submiitted - and sometimes granted - for power stations using agrofuels. In Germany and Italy, large amounts of electricity are being generated from burning vegetable oil already - and in nearly all cases palm oil is being used because this is the cheapest. It is the huge increase in demand for palm oil which is the biggest driver of deforestation in South East Asia, with huge consequences in terms of increased greenhouse gas emissions. There is every likelihood that this situation will be replicated in the UK : despite great quantities of greenwash that seek to project these new power stations as the cutting edge of environmental technology.Renewable energy generation in the UK is subsidised by Renewables Obligation Certificates (ROCs). These also apply to energy generated by biofuels - even palm oil. Biofuelwatch has the latest information on planned biofuel power plants. See also the Friends of the Earth campaign against subsidising agrofuels here and their Biofuels: The Road to Nowhere campaign. Biomass is the word usually used for solid rather than liquid sources of “bioenergy”. If used for power generation on a large scale, the impact is to increase the world market for timber, causing significant short-term release of carbon. Read more about biomass.